Jan. 12, 2019 News! [CFP] 2019 the annual meeting of IJLT Editorial Board, ICEDL 2019, will be held in Barcelona, Spain during July 14-16, 2019. February 28th! Vol. 5, No. 1, March 2019 issue has been published online! November 9th! Vol. 4, No. 4, December 2018 issue has been published online! August 24th! Vol. 4, No. 3, September 2018 issue has been published online! The journal receives submitted manuscripts via email only. Please submit your research paper in .doc or .pdf format to the submission email: ijlt@ejournal.net. 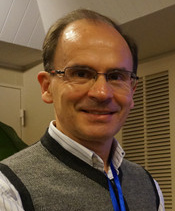 Xabier Basogain (ORCID code: orcid.org/0000-0002-6672-6897) is professor of the University of the Basque Country - Euskal Herriko Unibertsitatea. He is doctor engineer of telecommunications by the Polytechnic University of Madrid, and member of the Department of Engineering Systems and Automatics of the School of Engineering of Bilbao, Spain. He has taught courses in digital systems, microprocessors, digital control, modeling and simulation of discrete events, machine learning, and collaborative tools in education. His research activities include the areas of: a) soft computing and cognitive sciences to STEM; b) learning and teaching technologies applied to online education and inclusive education; c) augmented and virtual reality with mobile technologies. We are seeking professionals to join our Editorial Board. If you are interested in becoming a Editor, please send your CV and a one-page summary of your specific expertise and interests to the following email address. We will review your information and if appropriate, we will place you on our list of Editorial Board. Please send your application to: ijlt@ejournal.net.